As I have said many, many times before; I am all about weeknight shortcuts when it comes to cooking. I love to cook, don't get me wrong, but once in a while I enjoy taking the easy yet still semi-homemade way out. Usually I will plan more laborious dishes over the weekend when I know I will have more time to prepare, cook and clean all of the components for the dish. Well, when I got home Tuesday night and realized that I had planned my Sweet and Sour Chicken dish, I was less than thrilled. It's one of my favorite meals to eat, but not one of my favorite meals to prepare. My original recipe calls for cutting, breading (with cornstarch and egg) and sauteing the chicken, making the sauce and then the fried rice. Lots of steps, lots of dishes, and limited time with Mike and E in order to have it on the table at a decent time. So, while I was sitting on the couch trying to get motivated I had an a-ha moment. What if I just use the popcorn chicken I have in the freezer that we give E once in a while? Would that work? Would the chicken be as tender as the hand breaded version? In an effort to save my efforts I decided to go for it. Luckily Mike will eat anything, so even if it was a bust he would inhale it and be thankful. The good news??? It was delicious and SO EASY. I used the variety shown above, but you could use any brand of fully cooked frozen chicken. Nutritionally it was actually not as bad as I originally thought it would be (although not wonderful) and convenience won in this instance. I just controlled the portion size since I couldn't control all of the ingredients like I usually do when making everything from scratch. 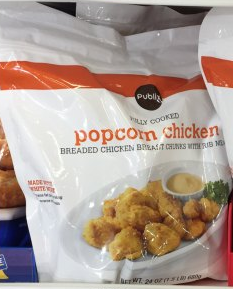 Get bag of frozen popcorn chicken (or any frozen variety) out of freezer. Prepare baking dish - I use 9x13 by lining with foil and spray with nonstick spray. Put desired amount of chicken into dish and top with sweet and sour sauce. Place into a preheated 325 degree oven and bake for 40 minutes turning once halfway through to evenly coat the chicken. Serve warm with this version of fried rice. Delish. The original recipe called for 3/4 C of sugar, but 1/2 C is plenty sweet in my opinion. You can play around with the amounts if desired. I use distilled vinegar, usually because that's what I have on hand, but apple cider vinegar can be substituted. Because the sauce is so yummy, if I am doing a larger batch of chicken I will sometimes double it for extra yumminess. If taking the shortcut of frozen chicken isn't for you, here is a great recipe, similar to this one, that shows step by step for breading and sauteing your own from scratch.